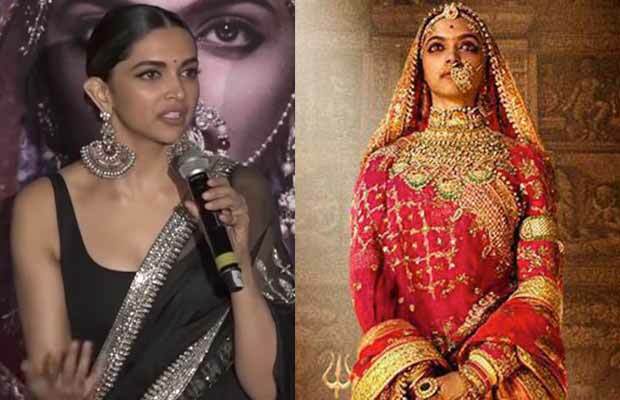 Deepika Padukone feels that Queen Padmini’s soul is around blessing the film Padmavati! Deepika Padukone starrer Padmavati has been facing issues since the makers started the shoot of the film. Right from the sets being vandalised to Sanjay Leela Bhansali being slapped by the member of Karni Sena, the hurdles were just endless. The threats of Karni Sena affected the promotions of the film so much that there was no event for the official launch of Padmavati’s trailer. But today was the launch of the trailer in 3D in Mumbai. And to everyone’s surprise Deepika attended the event. She shared the stage with Shobha Sant, the CEO of Bhansali Productions, and Ajit Andhare of Viacom 18. But whichever questions were asked to the actress about the Karni Sena, they were dodged saying that “the queries won’t be answered”. It was only towards the end of the event that a journalist asked Deepika as to how she gathered courage to promote the film amid the protests. Padmavati has been gathering praises from all over. The trailer and the song Ghoomar are already a hit. Starring Shahid Kapoor and Ranveer Singh along with Deepika Padukone, the film is slated to release on December 1, this year. Previous articleRannvijay Singha Defends Bigg Boss 11 Contestant Priyank Sharma! Next articleNew York Terror Attack Happens Just 5 Blocks Away From Priyanka Chopra’s Home, Actress Reacts!